Here you will find all the publications currently available from Cardiobase. Please click the thumbnail to view. This report applies control system concepts to Cardiovascular Information Systems to see itthere is an opportunity to improve patient care. By providing background on what open and closed loop systems are the report conceptualizes that some patient care is open loop and more complex care such as Cardiology is closed loop. The background highlights the feedback loop as an important element of system performance and how it can be used to optimize system performance. The report explores case studies of reducing the feedback loops in referrals, studies and reports, inpatient order communications, booking and reporting. The case studies found that in all cases, optimizing the feedback loop improves patient care by increasing the speed to effective treatment, reduced administration, reduced data entry effort, feweropportunities for error, reduced billing leakage, increased room utilization and reduce bed-timeper inpatient. The most profound finding in the report is that when the system is conceptualized as a whole, the optimization benefits compound as the smaller feedback loops affect larger feedback loops. 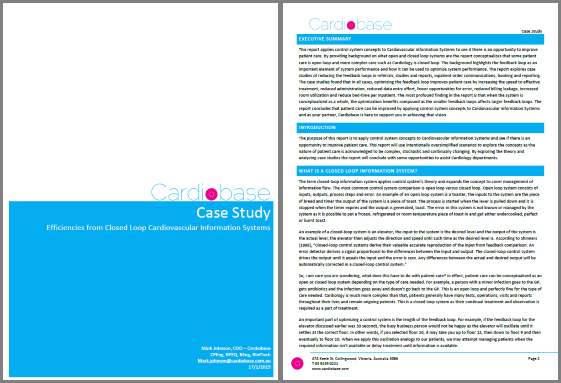 The report concludes that patient care can be improved by applying control system concepts to Cardiovascular Information Systems and as your partner, Cardiobase is here to support you in achieving that vision.